GALLIPOLIS — Bridgeport Equipment and Tool recently donated a flatbed trailer to District 2 Fire Department (D2FD), which will be used to haul equipment needed for the department’s dive/water rescue team during emergencies and for training sessions. The donation of the trailer was a result of a discussion between Gallia resident David Mills, who is also the store manager for Bridgeport’s Huntington location and Nathan Frazee, D2FD Dive Team Officer, about the dive/water team. Frazee said the donation will allow the team to respond with all the necessary equipment and gear needed for the emergency. 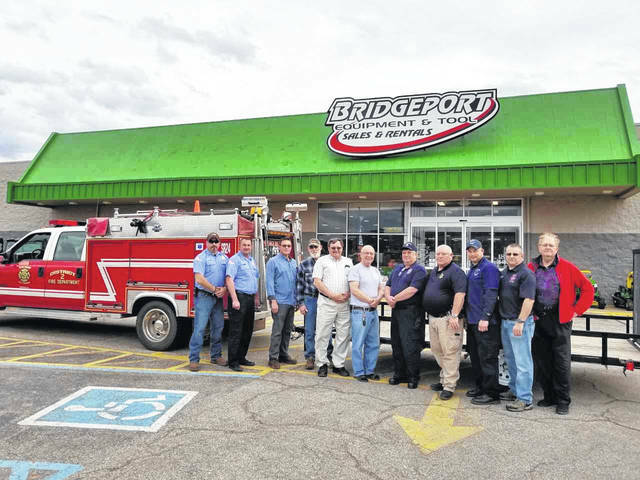 “We are proud to work with local businesses, like Bridgeport Equipment & Tool, to help support the community and allow us to respond to the emergencies that arise,” said Frazee. According to their 2018 annual report, the 22 firefighters that make up D2FD logged over 10,000 volunteer hours serving the community. They responded to 84 emergencies, including fires, wildland fires, wind storms, power outages and motor vehicle accidents. The firefighters, who are unpaid, spent 454 hours on these emergency responses and over 8,500 hours on maintenance and administrative functions. The department self-funded and implemented a six-member underwater rescue dive team and completed 120 dives in 2018. The team is a member of the Ohio Region 7 Water Rescue, covering 11 Ohio counties. Information provided by the Gallia County Chamber of Commerce.